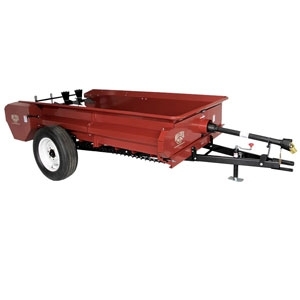 Our Full-Size manure spreaders are made with Millcreek's signature heavy gauge steel and farm-tough construction. These spreaders are built to handle the manure of at least 20 to 25+ livestock and come with a PTO-driven power train. With the same low profile as our other spreaders, the large capacity models are ideal for large stables, small dairy farms and spreading bulk materials. The Model 127 comes standard with the upper beater for high efficiency spreading making it a perfect solution for busy small farms. Millcreek is the first manure spreader manufacturer to offer a stainless steel body. The Super Spreader (SS) configuration provides extra protection against rust and corrosion. Our Full-Size manure spreaders will give you worry-free operation and heavy-duty service for years to come.